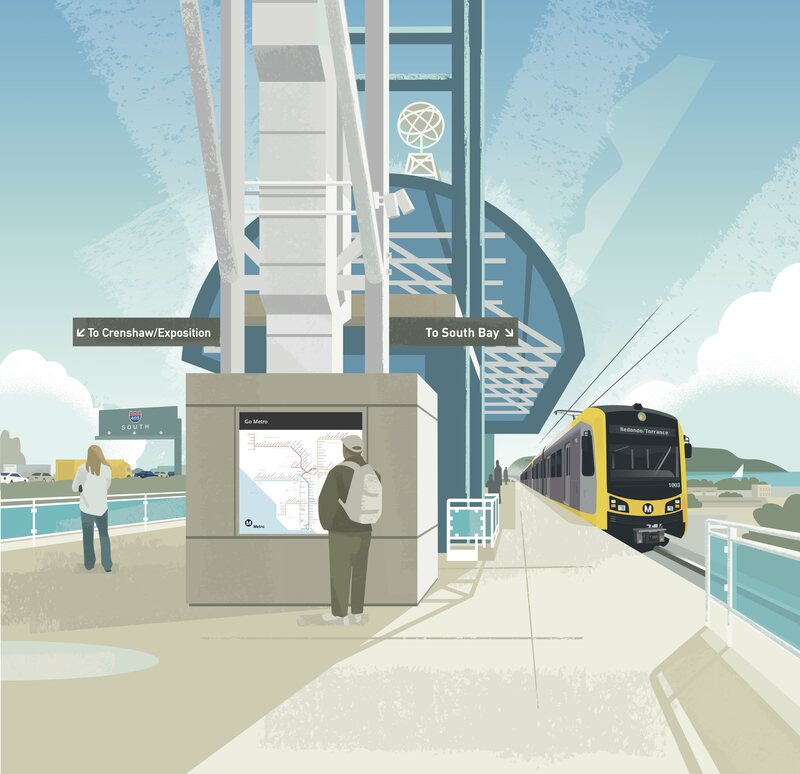 Metro will hold three community meetings later this month to discuss the current alternatives for a project that proposes to extend the Green Line for 4.6 miles from Redondo Beach Station to a proposed Regional Transit Center (RTC) in Torrance. The extension will be served by trains from both the Green and Crenshaw/LAX Lines. Tuesday, April 17, 6 to 8 p.m.
Thursday, April 19, 6 to 8 p.m.
Thursday, April 26, 6 to 8 p.m.
A Supplemental Alternatives Analysis (SAA) Study is currently being prepared for the project. Metro is soliciting feedback from corridor cities and stakeholders to refine and update alternatives. At the conclusion of the SAA, a new or refined preferred alternative(s) will be recommended to the Metro Board of Directors for consideration this summer. The public meetings provide the public an opportunity to comment on the project purpose, goals and the alternatives currently being evaluated. Whatever happened to the LA Metro studies of upgrading the Santa Fe (BNSF) Harbor Subdivision to provide much-needed ONE-SEAT DMU express service between Union Station and LAX. See http://media.metro.net/projects_studies/harbor_subdivision/faqs.htm. The current plan to require passengers to transfer between the Blue and Green Lines to reach LAX is totally unacceptable, especially since Metro’s own projections are that only 1,790 daily LAX passengers, or a paltry of 0.7% of LAX passengers, will use this service (see Table3-5 of http://media.metro.net/projects_studies/green_line_lax/images/amc_part_3_evaluation_of_alternatives.pdf). This is in sharp contrast to the 11% of JFK traffic carried by the JFK AirTrain to and from two off-airport stations which provide ONE-SEAT rail service to and from Manhattan. AirTrain JFK (and Newark) count as a second seat with multi-level transfers. The true one seat service from Union Station to LAX remains the FlyAway bus. This extension isn’t very ambitious. It doesn’t bring much rail service to South Bay. Maybe it’s a start. The interesting thing I see here is an implication that the Crenshaw Line will eventually go down that far. Until now, it had been an unanswered question of whether it would stop at LAX or go further south onto the Green Line tracks. Is there a timeframe for when service patterns for the Crenshaw and Green Lines will be announced? Not that I’m aware of. As soon as it’s ready to go public I’ll put it out there! It is unfortunate that this line is not already being proposed to extend down to Long Beach and connect to the Blue Line. So shortsighted. Yes! Yes! Yes! Perhaps have a stop at CSULB, although that may be too out of the way. I happen to agree with Jon’s comment that the South Bay rail extension should go down to Long Beach and connect at some point to the Blue Line. However, I really can’t understand why it doesn’t include a stop at Del Amo Fashion Center. The site of the proposed Torrance Transit Center is again a “non-destination”. The DA Fashion Center is a REAL EXISTING DESTINATION with plenty of shops, restaurants and cinemas. It’s a place where people go and hang out as well as shop and spend. Why on earth is there not a stop planned for it!!! One day it will be NORWALK???? Y’all make me SICK!!!! METRO!!! Why isn’t there an option for a fully elevated alignment along Hawthorne? Alternative 4 just diverts back to the row half way down. adding an uneccesary S curve… lemme guess, too expensive?